Very interesting interview, Patricia! I learned a lot - you did a great job. 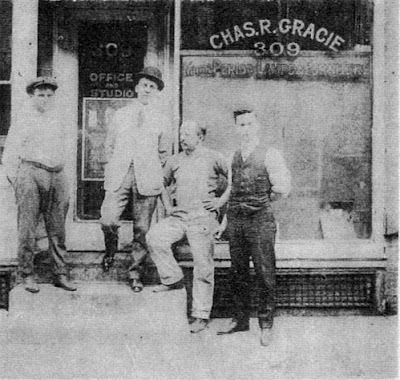 I had no idea about the origins of Gracie. Fascinating. It's so rare that a business can continue to be run by members of the original founder's family for so long. An amazing legacy. How exciting! What a great interview. The companies history is fascinating and it is so nice to see that it is still firmly in the grasp of the family. I love the old invoices, what treasures. The William Haines silver pattern is so gorgeous - I'm in love. So true, it is amazing and rare to have a family run business for over a century and still going strong. I was so excited when I saw those old Purchase Orders. And what a huge order Elsie de Wolfe placed. She must have been papering a castle. Wow, great interview indeed! I didn't know anything about the history of this company, nor their famous clientele! Very interesting. So interesting to learn a little more about this legendary company. These panels are so beautiful and I am happy to witness a new surge in popularity via the fashion industry. Great interview Patricia! Yes they do indeed have some very famous and legendary clientele. 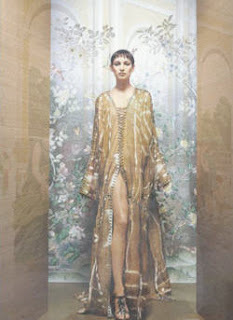 The fashion element is very interesting and so forward thinking of this Company. It's called diversification. What a beautiful post! 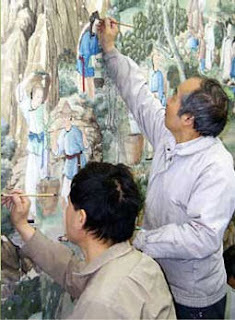 I loved the pictures of the artists painting the wallpaper. 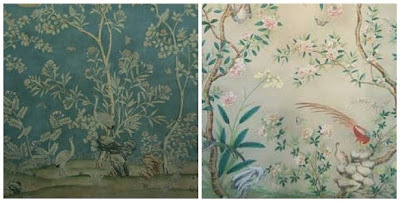 I always read 'hand painted', but somehow I never envisioned artists actually painting the wallpaper. They are truly works of art! 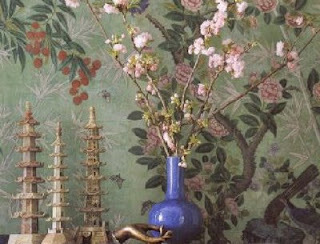 My grandmother has hand painted wallpaper in her home, and says it was the one of the most expensive decorative items in the house (and she has a house filled with priceless antiques). I am going to call her and check whether it is Gracie wallpaper. 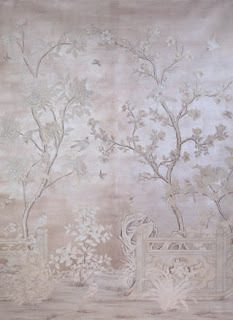 Please let me know if it is Gracie wallpaper that your grandmother has. How very feminine it all is! I think these days, handmade is the ultimate luxury. Good point... I agree that handmade is luxury and hopefully not going to be lost. Wow, how facinating! I just love their wallcoverings and it was great to hear the background on this great company. Thanks for sharing Patricia! 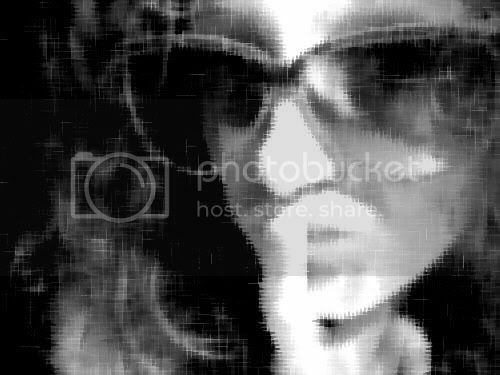 Looove this blog; mind if I add you to my blogroll? Fascinating yes!! Thanks for your comment. Not at all, you are added to mine! This was terrific - thanks for taking the time to do it and post it. Kudos on a great interview! What a great and interesting interview!! Great job Patricia! Yes I agree - these papers do add a classic, chic elegance to a room. I was so interested to learn that this was the paper that Billy Haines had used so frequently in the decoration in the homes of his Hollywood clients. What a fabulous interview! I loved learning more about what goes on behind the scenes at Gracie! What a learning experience. I especially enjoyed reading the history of the company. I love the silver paper that was recently reintroduced, it's almost contemporary in feel. I hope you plan to do more interviews in the future, your questions led the discussion on just the perfect road. Wow that is a compliment coming from you the gal from NYC who is there in the midst of it all. 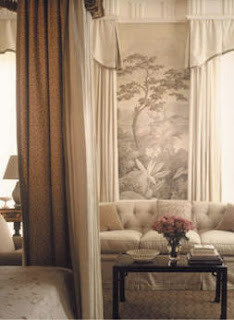 You're right about the contemporary feel of the William Haines silver wallpaper. I'm glad you liked the interview.